This Saturday (04-July-09) we had a Release Party at Pune. It was fun ! And, the one vein of feedback that we received was “we need to do this more often, and, have regular meetings”. Fine enough, we can see to that. The organizers did a wonderful job of getting the show on the road and, helping wrap things up – a strong start and, a strong finish made it a wonderful experience. We had around 50 people turning up and, with the number of Red Hat folks walk-in, that number would be well over 65. The DVDs were available throughout the meet and, they sure came in handy as folks requested extra media to pass around as well. Towards the end of the meeting, Ramakrishna took off for Bhaskaracharya Pratisthan where around 100 teachers had gathered to talk about curriculum and Open Source and, he ensured that he had enough media to hand around and, notes to show off things. 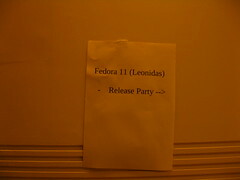 Photos are available with the tag “Fedora Release Party” The day kicked off with a short welcome address by Rahul Sundaram and, we dived into showing off some videos. Particularly, we got a strong response around the Red Hat Way. It moved into the new items that are in Fedora 11 and, predictably enough, there were plenty of questions around filesystems (ext4) and virtualization (libvirt and KVM). Rahul passed the mic to Rakesh who talked about Package Management, PackageKit, RPM (including a somewhat quick run-down of the RPM internals). 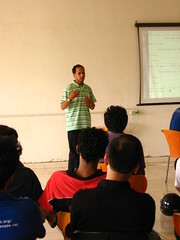 It was time for Prasad to step-up and, talk about his projects and how, he got into FOSS and, learnt new languages by devising projects. There were moments of hilarity as the demo instance of pem was using Kushal’s expenses and, we sort of opened up Kushal’s accounts for the participants to ogle at 🙂 Kushal showed off Sugar on a Stick and, talked about Sugar in specific and Sugar-Fedora parts in general. 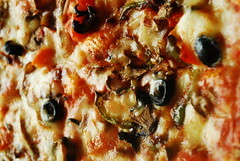 The pizzas (link to image) provided an opportunity to get the interaction going. Especially since there were students in the crowd and, that generally leads to lots of discussions and rapid-fire Q/A. Post lunch, we had a demonstration by Satish of the work-in-progress Moblin Spin based on Fedora and, a quick introduction to Spins by Rahul. The latter was aimed at taking in feedback about what spins/remixes are worth investing time and effort on and, also an extension to the “what package is missing” survey that he conducted some time back. And, with that it was a wrap. It was wonderful to meet new people. watch the infrequent Fedora T-Shirt in the crowd allowing folks to take note of the communication means (web-page and IRC channels). Having a discussion about localization and, internationalization specifically aimed at understanding how content in local language could be produced using Fedora. “What does it take to be good at something at which failure is so easy,so effortless ? ” : a quote from Better: A Surgeon’s Notes on Performance by Atul Gawande which is a highly recommended reading for those who have not read it yet (that’s a link to the flipkart.com entry for those who are local). Last evening over dinner, among other things, Runa and me got talking about translations and, translation quality. That is one of our favorite shop-talk items and, since the morning blog had bits about my performance with spellings, it was a bit more significant. It is a somewhat known issue that most translation teams measure the length of the sprint, that is, how many strings were completed or, the percentage of the coverage for a particular project. Some projects attach badges like “supported” / “unsupported“, “main” / “beta” to the coverage and thus make the rush to the tape more important. At some point in time, it is important for the teams to sit down, understand and make notes about the quality of translations. Left to itself, the phrase “quality of translations” doesn’t mean anything does it ? For example, if the phrase was “Disconnect from VPN…” and, you were required to translate it – how wrong can you go ? It seems you can go wrong, and, most often do. One of the reasons that I have observed is that translating strings in application and, translating content like documentation/release_notes/guides require different kind of mind patterns. The third reason is that most translators do not take time out to first use the application in English (or, read the documentation completely in English) and, use it again (or, read it again) after translation. That is a recipe for disaster. English is a funny language and, sometimes, due to the structure of the source files, the context of the content is lost. What does look like a simple word might have a funny implication if the comprehension about how it is placed within the UI or, the user-interaction flow is not made a note of. Now that most projects have some kind of “localization steering committees” it would be a good small project to observe which locales are coming up with the highest quality of translations and, attempting to understand what they are doing. Asking the language teams about the reasons that inhibit them from maintaining a high quality would also enable deeper understanding of how a project can help itself become a better one (in a somewhat strange loop way). Such discussions would enable coming up with Guidelines for Quality which are important to have. I firmly believe that all developers desire that their applications be consumed by the largest number of audience possible and, at heart, they are willing to sit down and listen to constructive suggestions about how best they can help the localization teams make it happen. That is the sweet spot the “LSCo” folks need to converge on and get going. In fact, for projects like OLPC, where a lot of new paradigms are being created, understanding translation processes and, chipping away at improving translation quality is highly requested. Translation is still an activity that requires a fanatical attention to detail and, that little bit of ingenuity. There is something not right about committing a translation that smacks of a “letting go of the disciplined focus on detail” and, does not contain anything new. The job is made somewhat more hard when it comes to documentation. One cannot (and, perhaps should not) go beyond what the author has written and yet, it has to be made available in the local language after “stepping into the shoes” (or, “getting into the mind”) of the original author while making it aligned with the natural flow of the target language. This is also the place where the “translator memory”, as opposed to the “Translation Memory” becomes important. The mind should be supple enough to recall how similar idioms were translated earlier or, if an error that was already reported has cropped up again. Translators have a significant bit to contribute towards making the translation source files better, cleaner, well-maintained and, well documented. And, they have to do it right every time. All this would come together to produce high quality translations and, wider usage of applications and documentation. Collaboration for the win ! Have fun at GUADEC ! I had submitted a talk for the GUADEC which was accepted. However, in light of this blog entry, my decidedly infrequent contributions to GNOME and, an inability to travel using my own finances, I decided that there was no glory in asking for travel+lodging assistance. So, once again, I am not going to be at GUADEC ! Some day I will make it though. One of the reasons that GCDS was interesting for me was the chance to talk about localization in terms of improving the context of the localization-ready content. During translations, one often encounters sentence construction which does not have context and, providing a means to overcome the issue in a gradual manner would make for much nicer localized UIs. Additionally, learning about improvements to the GNOME L10n infrastructure was a secondary goal. The ulterior motive was also to know about the project’s plans to outreach to groups of students beyond the obvious GSoC and, how to use the project’s knowledge to teach open source. This weekend we are organizing a small gathering at Pune for the Fedora faithful. Details about the Release Party are here. Besides getting the Fedora folks to hang out together and share notes, we hope to have some fun, get some show-n-tell going. Photographs and event reports would eventually follow as well.